US Senator’s lead by Sen. John Kennedy and Sen. Marco Rubio call for authorization of force to protect Kurds in Rojava before they will be slaughtered again by Middle East terror regimes. Brussels, 3 Feb 2019 - Middle East Diplomatic - US Senator’s lead by Sen. John Kennedy and Sen. Marco Rubio call for authorization of force to protect Syrian Kurds before they will be slaughtered once again by Middle East terror regimes. US Senator’s introduced newly the Authorization for Use of Force to Defend the Kurds in Rojava / Northern Syria Resolution as an amendment to S-1, Strengthening America’s Security in the Middle East Act. 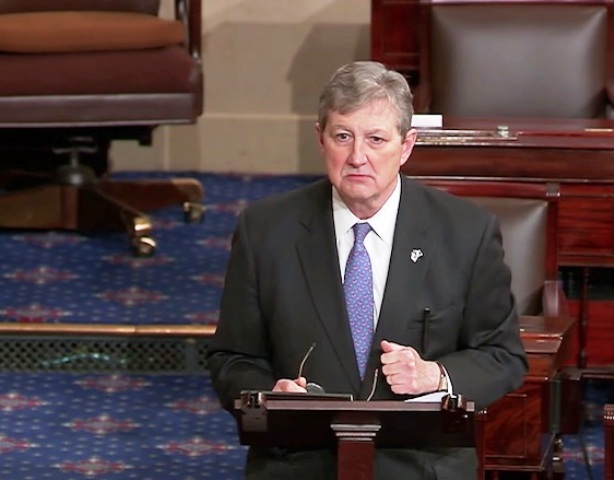 Speaking in the US Senate chamber, Sen. John Kennedy called on the members of Senate, the newly elected 116th US Congress and US President to adopt an amendment to its first piece of legislation in said : “We should not leave the Kurds to be slaughtered after they withstood incomprehensible suffering in the fight against the so-called Islamic State”. Kennedy described his amendment, explaining why it was necessary. In the process, he delivered an extraordinarily eloquent account of the struggles, oppression, and repeated betrayals of the Kurdish people over the past century-since the collapse of the Ottoman Empire following its defeat in World War I.
Kurds have been American’s and European’s most important allies in the fight against the terror regimes particularly in war against Islamic State ISIS. Over 15.000 Kurdish young men and women sacrificed their life against terror to protect humanity against Islamic terror gans and around 20.000 of them have been wounded or handicapped all life. Kennedy’s amendment would first of all protect the Kurds in Syria but it would also effect positively the difficult situation of Kurds who are surrounded by the Islamic terror regimes in the Middle East. There are around 45 million of Kurds living under difficult situation in Iran, Turkey in Syria while Iraqi governments never respect better conditions for Kurds in the self governed Kurdistan region in KRG.